Switzerland (German: Schweiz; French: Suisse; Italian: Svizzera; Romansh: Svizra; Swiss German: Schwiz) is a small country in Western Europe. The official name of Switzerland is Confoederatio Helvetica. This is Latin and is not often used except for state documents. Switzerland is a federation of even smaller states - 26 cantons. Switzerland is known for its neutrality. A country is neutral when it does not take sides among the countries who are at war. Switzerland has been neutral since 1815. Many international organizations are in Switzerland. The United Nations has a main office (but not its headquarters) in Geneva. Its predecessor organization, the League of Nations, was headquartered in Geneva. There are four official languages in Switzerland: German, French, Italian, and Romansh. Some cantons and even towns have two languages spoken in them, and the largest canton by area, Graubünden, has three. About 2/3 of the population speak German; French is spoken in the west of the country, while Italian is spoken in the canton of Ticino and Romansh in parts of Graubünden. The capital of Switzerland is Bern. The largest city of Switzerland is Zürich. To the north of Switzerland is Germany. East of Switzerland are Austria and Liechtenstein. To the south of Switzerland is Italy. To the west of Switzerland is France. The area of Switzerland is 41,285 km². The confederation is divided into 23 full states called cantons. All 26 cantons are: Aargau, Appenzell Innerrhoden, Appenzell Ausserrhoden, Basel-Stadt, Basel-Land, Berne, Fribourg, Geneva, Glarus, Graubünden, Jura, Lucerne, Neuchâtel, Nidwalden, Obwalden, Schaffhausen, Schwyz, Solothurn, St. Gallen, Thurgau, Ticino, Uri, Valais, Vaud, Zug, and Zürich. The mountains are very tall in the center and south of Switzerland. About 60% of Switzerland is in the Alps area. Only few people live here. The highest mountain is the Dufour Peak at 4,634 m.
Many of the mountains have ice all year. This ice is called glaciers. The rivers Rhine, Rhône, and many other rivers start in the mountains of Switzerland. There are many lakes in Switzerland. The biggest lakes are all in the north and west: Lake Geneva (Lac Léman), Lake Zürich, Lake Neuchâtel and Lake Constance (Bodensee). Mountains in the north of Switzerland are fewer and smaller. That is why most Swiss people live in cities and towns in the north. The Jura mountains are in the northwest of Switzerland. Switzerland has 2,485 villages, towns and cities. There are about 8.4 million people in Switzerland. About 64% of the people speak Swiss German (German Alemannic) as their first language, in northern and central Switzerland. 19% of the people speak French as their first language, mainly in the west of Switzerland. 8% of the people speak Italian, in the south of Switzerland. Only 1% of the people speak Romansh, in the southeastern part of Switzerland. Romansh is an old language that is similar to Latin. The German-speaking people of Switzerland do not actually speak "German" as their native language. Swiss people speak something called Alemannic which has its own writing language and grammar but still is normally considered a German dialect. Alemannic may be difficult for Germans to understand. Swiss people do write like the people from Germany and also speak standard German very well, especially in the larger cities. About 23% of the people in Switzerland do not come from Switzerland. They come from other places to usually work in Switzerland. The religion of most people in Switzerland is Christianity. 43% of the population follow Catholicism. 35% of the population follow Protestantism. 2% follow Eastern Orthodoxy. The religion of 4% of the population is Islam. The rest follow other religions, or they have no religion. Switzerland is famous for its chocolate, cheese, banking system, watches and mountains. In 1291, people from Uri, Schwyz and Unterwalden wanted to be free. They signed a contract to work together called the Eternal Alliance. Together, they could be free from the people of Habsburg, who were very strong. In 1315 the people from the Eternal Alliance fought the Habsburgs in battles at Morgarten, Sempach and Näfels. The people of the Eternal Alliance won all the battles. People from other areas signed the contract and joined the Eternal Alliance. More and more people worked together to be free. In 1648, other countries from Europe made an agreement that Switzerland was free. The name of this agreement was the Peace of Westphalia. More areas came to be part of Switzerland. In 1798, France invaded Switzerland. The ruler of France was Napoleon. He changed many laws. In 1815 Switzerland again became independent from France. Other countries agreed at the Congress of Vienna that Switzerland was free and neutral. The constitution of Switzerland that was made after a short civil war in 1848 was replaced in 1999. Switzerland did not fight in World War I or World War II. Since 2002, Switzerland is part of the United Nations. It did not join the United Nations for 57 years because of its neutrality. Switzerland is a republic. Switzerland does not have the same kind of president as the United States or France. Seven people (called ministers) do the job of president. They are called the Federal Council in English, Bundesrat in German, Conseil Fédéral in French, Consiglio Federale in Italian and Cussegl Federal in Romansh. Every year one of these people is made president. The president is not more important than the other six people. At present 3 of the 7 people are women. There are two parts of parliament in Switzerland. The Council of States and the National Council. Only both together can make laws. There are 46 people in the Council of States. Every full canton of Switzerland can send 2 people. There are 200 people in the National Council. The biggest canton sends most people to the National Council. The smallest 6 cantons can only send one person to the National Council. The people of Switzerland can collect signatures if they do not like a new law or a law change. This is called a referendum. If enough people sign a referendum, the people vote. The people can also collect signatures to change the constitution. This is called an initiative. The constitution is the basic law of a country. Switzerland is not a member of the European Union, but it is member of the European Free Trade Agreement (EFTA). The EFTA makes trade with other countries in Europe easier. In 1999 Switzerland and the European Union made a contract. This contract makes trade even easier. They recently made two other contracts. The banks of Switzerland and the insurance companies in Switzerland together produce eleven per cent of the gross domestic product. Tourism is important in Switzerland. There are many places for tourists. Davos, St. Moritz, Pontresina and Flims are in Switzerland. These towns are important both in winter (for skiing) and in summer. Tourists also like the cities of Lucerne, Geneva, and Zürich. In 2011 the pharmaceutical industry in Switzerland directly and indirectly employed about 135,000 people. The companies Novartis and Roche are the second and third largest pharma companies in the world. They both have invented many life saving drugs because of well developed research and development facilities. The literature of Switzerland is divided according to the language used. Most Swiss literature was written in German from 1291 until 1798. 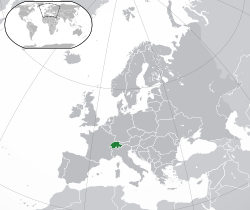 French became popular in Bern and elsewhere in the 18th century and many words also in the German speaking parts of Switzerland come from the French and are not known to Germans. Italian language and Romansch-Latin literature are less common in Switzerland. Heidi, a book for children by Johanna Spyri, is the most famous book of Switzerland. It is in the mountains in Graubünden. Skiing, snowboarding and mountaineering are among the most popular sports in Switzerland. Because of the large mountain range the nature of the country is well suited for such activities. Bobsleigh was invented in St. Moritz. The first world ski championships were held in Mürren (1931) and St. Moritz (1934). St. Moritz hosted the second Winter Olympic Games in 1928 and in 1948. Among the most successful skiers and world champions are Pirmin Zurbriggen and Didier Cuche. Many Swiss are fans of football. The national team or 'Nati' is widely supported. Switzerland was the joint host, with Austria, of the Euro 2008 tournament. Many Swiss also follow ice hockey. In April 2009, Switzerland hosted the 2009 IIHF World Championship for the 10th time. The National League A is the most attended league in Europe. The many lakes in the country make Switzerland a good place for sailing. The largest, Lake Geneva, is the home of the sailing team Alinghi. They were the first European team to win the America's Cup in 2003. They also won in 2007. Tennis has become more popular. Swiss players such as Martina Hingis and Roger Federer have won multiple Grand Slams. In an eight-year span, Roger Federer has won a record 17 Grand Slam singles titles, making him the most successful men's tennis player ever. Motorsport racecourses and events were banned in Switzerland after the 1955 Le Mans disaster. There were exceptions for events such as Hillclimbing. This ban was overturned in June 2007. During this period, the country still had successful racing drivers such as Clay Regazzoni, Sebastian Buemi, Jo Siffert and successful World Touring Car Championship driver Alain Menu. Switzerland also won the A1GP World Cup of Motorsport in 2007–08 with driver Neel Jani. Swiss motorcycle racer Thomas Lüthi won the 2005 MotoGP World Championship in the 125cc category. Traditional sports include Swiss wrestling or "Schwingen". It is an old tradition from the rural central cantons and considered the national sport by some. Hornussen is another native Swiss sport. It is like a cross between baseball and golf. Steinstossen is the Swiss version of stone put, a competition in throwing a heavy stone. It is recorded to have taken place in Basel in the 13th century. It is also central to the Unspunnenfest, first held in 1805. ↑ De jure "federal city"; de facto capital. Because of historical federalist sensibilities, Swiss law does not designate a formal capital, and some federal institutions such as courts are in other cities. ↑ Federal Constitution, article 4, "National languages" : National languages are German, French, Italian André jnmFederal Constitution, article 70, "Languages", paragraph 1: The official languages of the Confederation are German, French and Italian. Romansh shall be an official language for communicating with persons of Romansh language. ↑ "Population size and population composition". Swiss Federal Statistical Office. Swiss Federal Statistical Office, Neuchâtel. 2010. Retrieved 2011-04-29. ↑ 4.0 4.1 4.2 4.3 "Switzerland". International Monetary Fund. Retrieved 2010-04-21. ↑ "Human Development Report 2010" (PDF). United Nations. 2010. Archived from the original (PDF) on 8 November 2010. Retrieved 4 November 2010. ↑ "Neutrality and isolationism - Switzerland - Information". swissworld.org. Retrieved March 27, 2010. ↑ Swiss Federal Statistical Office. "Languages and religions - Data, indicators". Retrieved 2007-10-09. The first number refers to the share of languages within total population. The second refers to the Swiss citizens only. ↑ Ausländerinnen und Ausländer in der Schweiz - Bericht 2008 (German) (1196 KiB), Swiss Federal Statistical Office, page 12. ↑ Stephan Vaterlaus, Stephan Suter and Barbara Fischer, "The Importance of the Pharmaceutical Industry for Switzerland", A study undertaken on behalf of Interpharma, September 2011. ↑ "Swiss Literature". admin.ch. Retrieved 2008-03-04. ↑ "IIHF World Championships 2009 official website". Iihf.com. 2009-05-10. Retrieved 2010-04-29. ↑ Geering. "Hockeyarenas.net". Hockeyarenas.net. Retrieved 2011-11-03. ↑ "Switzerland lifts ban on motor racing". GrandPrix.com & DueMotori.com. 6 June 2007. Retrieved 23 September 2008. Wikimedia Commons has media related to Switzerland. This page was last changed on 19 February 2019, at 16:44.